I am also linking this card to the Simon Says Monday “Party Time” Challenge- if you have not had a chance to stop by the SU-Only Challenge site to check out the rest of the Design Team projects or the Simon Says Challenge site, I hope you will do so- spectacular inspiration from all! 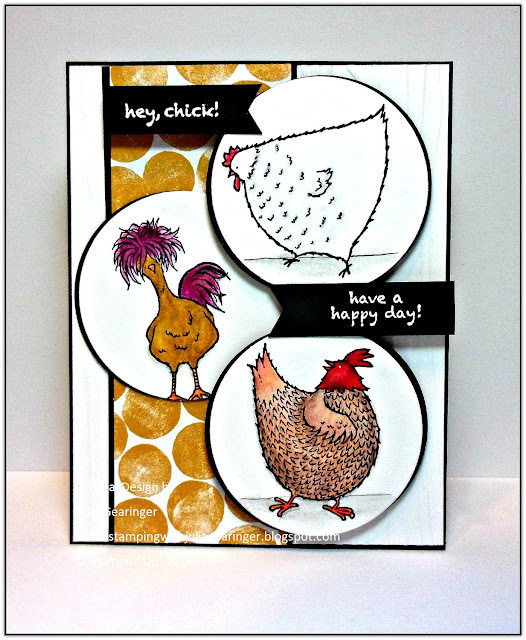 Ink the Hey, Chick images with Stampin’ Archival Basic Black Ink and stamp onto Whisper White cardstock. Die cut the images with Circle Framelits™ (also die cutting two circles for each image from black cardstock). Color the stamped chicken images with the new Stampin’ Up! Watercolor Pencils (yes, you read that correctly, the new Occasions Mini will have watercolor pencils in colors to match sixteen of the exclusive SU! Colors- yea!!) along with Stampin’ Write Markers. Once you are satisfied with the coloring of the images, use Clear Wink of Stella to add shimmer to the chickens (I added it to their head areas :-)). A chick has to have some shimmer, right? Layer the die cut black circles behind the images and set aside. Emboss a piece of Whisper White cardstock with the Woodgrain Textured Impressions™ Embossing Folder, trim and mount onto a piece of Basic Black cardstock, trim and mount onto the Whisper White card base. Adhere a strip of the Serene Scenery DSP Pack paper onto Basic Black cardstock and mount into the card front. Heat emboss the sentiments from Hey, Chick with white embossing powder onto Basic Black cardstock creating the fish tail banners either by hand or using the retired Hexagon Punch (you can also use a square punch). Thanks again for taking the time to visit – I hope that you will create your own Stampin’ Up! Only project and play along with our “Circles or Ovals or Squares, Oh My!” challenge! Hugs and have a blessed Christmas week, my friends! Great card! Thanks for sharing. I think I will CASE it for my mom who just moved to assisted living and is having a tough time with it. Mary- thanks for taking the time to comment :-) So sorry to hear about your mother and feel free to CASE it for her. I hope it will bring a smile to her face since I am sure that this stage of her life is quite an adjustment- hugs to you and your mom! !